Herbal limeade is one of those things that you don't really know what you are missing until you try it. It doesn't necessarily sound all that appetizing or refreshing, but I guarantee it is both! My love of herbal limeade started thanks to one of my favorite restaurants in Charlotte. They make this amazing limeade that is actually blended with rosemary, mint, and basil. It's definitely more herbal than limeade, but it totally works! It's like a green drink that you actually WANT to drink. Since I can't get my hands on their herbal limeade around Atlanta, I thought I would venture into making my own! My version is more limeade than herbal, but it's still totally delicious and extra refreshing. Start by making your herbal simple syrup. If you have your own herb garden, raid it for a few sprigs of rosemary, mint, and a couple basil leaves. 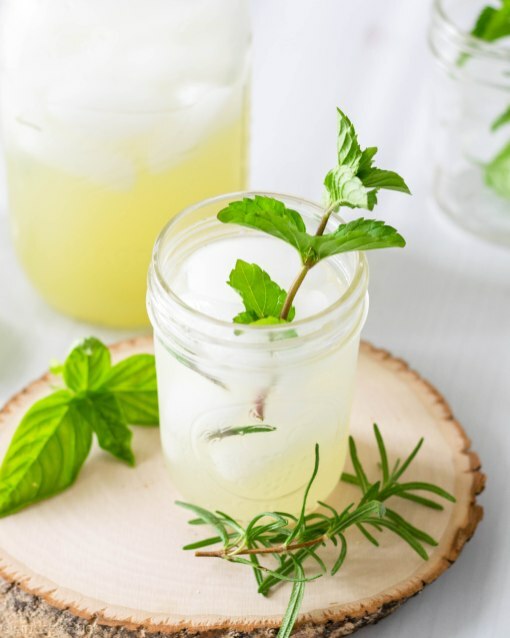 The main flavors in this limeade are rosemary and mint, so you will want more of those two. Place the sugar, water, herbs, and the zest of one lime into a small saucepan. Let it simmer until all the sugar has dissolved. Then turn off the heat and let the simple syrup cool with the zest and herbs still in there to extract as much flavor as possible! While that cools, squeeze the heck out of a bunch of limes (and a few lemons). Limes are stubborn little suckers and don't give up their juice easily, so if you have a juicer NOW is the time to use it! Strain the lime juice into a fresh container to get rid of any seeds or pulp (unless that's your jam), then strain the simple syrup to remove the herbs and zest. Add the syrup to the lime juice then add enough water until it suits your taste. I typically stick to 1 part lime juice to 2-3 parts water. Stick a few more sprigs of rosemary and mint in there to keep the herbal flavor alive and well while you sip on your delicious, refreshing, and (dare I say) healthy (?) beverage! Place the sugar, 1 cup of water, herbs, and zest in a small saucepan. Place it over medium-low heat and bring to a simmer. Once sugar has dissolved, remove from the heat and let cool. Strain any pulp and seeds from the juice, then strain the cooled simple syrup into the juice and mix thoroughly. Add 1-2 cups of additional water to suit your taste. 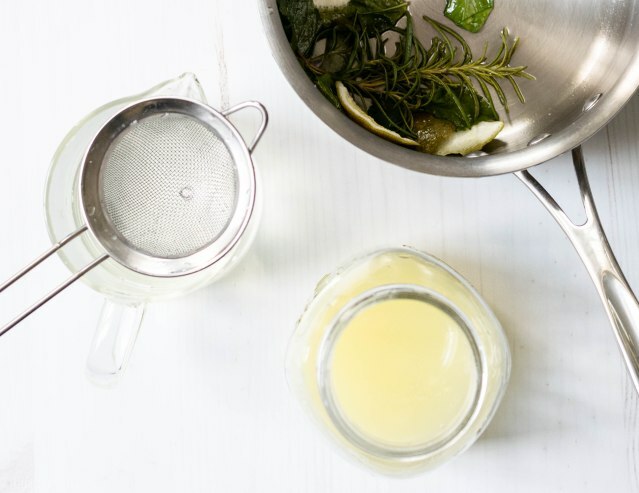 Notes: For an even more powerful herbal flavor, blend the juice with rosemary and mint leaves.